San Juan County Sheriff’s Office Undersheriff Steve Lowrance, left, is expected to fully recover after being shot in the face Tuesday. A San Juan County Sheriff’s Office deputy who was shot early Tuesday in a high-speed car chase came within “a half of an inch” of a possibly fatal injury after trying to prevent a suicidal woman from taking her own life, according to details released this week about the incident. San Juan County Sheriff Bruce Conrad said the La Plata County Sheriff’s Office and the Durango Police Department alerted his department shortly after 2 a.m. Tuesday that a high-speed pursuit was headed north on U.S. Highway 550 toward Silverton. Initial information indicated a Durango police officer had passed the vehicle – a four-door Toyota sedan out of Colorado Springs – parked in a residential neighborhood. When Durango police turned around to make contact with the car, it immediately took off, hitting speeds up to 60 mph in the residential area. 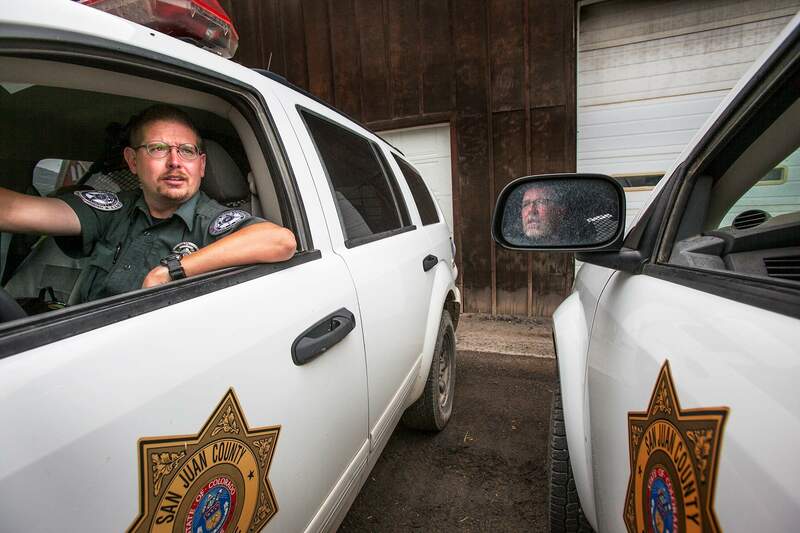 That night, San Juan County Sheriff’s Office Deputy Dean Mize was on duty when the call came in. Conrad said Mize called for backup and was joined by Undersheriff Steve Lowrance, and the pair started driving south on Highway 550 to intercept the vehicle. Conrad said the two deputies, driving in separate cars, passed the vehicle on the highway, then turned around to pursue it. The eluding Toyota slowed down, and the deputies were able to box in the car without having to make physical contact with any of the vehicles involved. The vehicle was stopped near mile marker 67, just north of Molas Lake. With the Toyota stopped, Lowrance approached the vehicle. Inside, there were three people. Conrad said the driver, a female, was reportedly suicidal. As Lowrance attempted to prevent the woman from taking her own life, she fired a round, killing herself. The bullet also struck Lowrance in the face. Conrad said the bullet – a .380 round from a handgun – traveled just off center of Lowrance’s lower lip and about an inch off center of his face. The bullet directly hit and knocked out a lower front tooth and exited through his cheek. Lowrance was taken to Mercy Regional Medical Center. He was later released and is expected to fully recover from his injuries. Conrad said the community is rallying around Lowrance, who has been with the Sheriff’s Office for six or seven years. He will be off duty for the time being, Conrad said. “He’s doing OK right now, but definitely remorseful he wasn’t able to save the woman’s life,” Conrad said. The female driver was identified as 30-year-old Amanda Christine Maes of Colorado Springs. One passenger, Stacey Sue Sam, 31, was arrested on unrelated charges to the car chase. A male passenger was held on a probation violation and questioned by police but not charged with any crimes, according to the Colorado Bureau of Investigation. Conrad said the case was transferred to CBI because it was an officer-involved shooting. CBI has not released any new information about the incident, other than the identities of those involved. As a result, it remains unclear why the vehicle initially eluded police or what may have caused the woman to take her life. “I have a lot of unanswered questions, too,” Conrad said. Conrad told The Silverton Standard & the Miner that the people involved in the chase are known to Durango police, and illegal drugs were found at the scene.